This 7 Pc Bamboossage® Facial Set will set you apart from all the other humdrum bamboo facials. Developed by an esthetician/massage therapist, it addresses both skin and facial muscles. Its design is durable, functional, cost-effective and practical. Warm them using a *towel cabbie or heating pad. They require minimal care. 1/2 oz of rice oil is included. 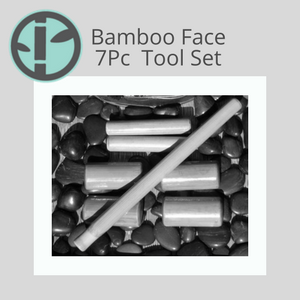 This 7 Pc Bamboo Face Toolset will set you apart from all the other humdrum bamboo facials. Developed by an esthetician/massage therapist, it addresses both skin and facial muscles. It’s design is durable, functional, cost-effective and practical. Warm them using a towel cabbie or heating pad and need minimal care. Included is 1/2 oz rice oil. Bamboo Face 7 Piece Tool Set comes with seven specific tools. These pieces mold comfortably in to the massage therapists hands. Their shapes glide and slide effortlessly over the face. And massage the muscles of the face with ease. The face muscles carry tension too and need a massage like any other muscle in the body. Relaxation leads to a youthful appearance. Bamboo Facial is a unique add-on for massage therapists and estheticians alike. Give your hands a break by treating your client’s face to a relaxing experience. Your client will love you and your hands will too. To heat, place Bamboossage® Face tools in a hot towel cabbie or on a heating pad. It only takes a few minutes to heat them. Use Wet Ones antibacterial wipes for the body. Not Clorox or Lysol as those are best used on counters. They can also be washed with soap and water. It is not recommended to leave them soaking in water. Or to use hospital grade antibacterial wipes, as this could damage the finish. Take advantage of the savings when purchasing the full course and tools together. Bamboossage® Facial Massage Online Certification w/7Pc Tool Set training comes with 8 CE ‘s (Continuing Education) for massage therapy, as well as certification. This NCBTMB (National Certification Board of Therapeutic Massage and Bodywork) approved course will take you step by step through the routine of all the moves using the tools. Included are the Digital Manual, Digital Video. Seven-piece Bamboossage® toolset is mailed separately and comes with free shipping. Click the link to learn more about: Bamboossage® Facial Massage Online w/7Pc Tool Set. Michelle D. Mace, CEO and founder of The Barefoot Masters® only develops continuing education to save the hands and body of the massage therapists. The continuing education hours are not applicable for estheticians. But, estheticians are welcome to take the course.